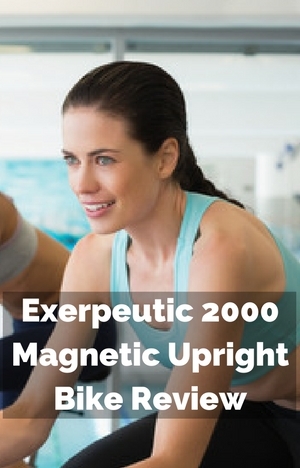 The Exerpeutic 2000 Magnetic Upright Bike comes with an extra feature. That you don’t often see on upright exercise bikes. Especially in this price range under $200. It has a fully adjustable seat. You can adjust it horizontally as well as vertically. This can help you with getting a better fit and be more comfortable than those where you can just adjust the height. It does have other features too, including a console, belt drive, precision weighted flywheel, 14 levels of magnetic resistance and oversized pedals. It certainly has the features for a good workout bike for in the home to get your cardio exercise. In my review I look at the seat as well as the other factors in detail to ensure that it meets the requirements of an upright exercise bike for the home and who it is for and who it isn’t. It seems to have left some people not too pleased based on reviews and their ratings and I take a look at whether that’s fair or not, also I checkout whether the price is reasonable too. The bike frame and crossbars are made of steel tubing that hold everything steady as you workout at all levels of intensity. It doesn’t flex or wobble about, so you can just get on with your workout and if you like enjoy some form of entertainment too without being distracted or disturbed. It has 2 levelers on the back stabilizer bar end caps that you can turn to stop any rocking back and forth due to a little unevenness in the floor. They do have a limited range so you may need to experiment with positioning if the floor has more than just a small amount of variation in it. The bike has a reasonably long warranty on the frame (better than a number of other warranties) but it’s 90 day on all other components is about average for the price. The seat can be adjusted vertically and horizontally to get a good fit for people between the heights of 5ft to 6 ft 3 ins. The height adjustment allows you to get the right setting for your leg to get the full range of motion which helps to prevent pain and injury. The horizontal position can help to get a more comfortable position in relation to the handlebars and pedals so that you don’t feel cramped up or are feeling like you have to lean forward too much. Making the adjustments doesn’t really get in the way of getting on with a workout. It takes seconds to make both adjustments if you have to because it has been adjusted since you last used the bike. The height involves loosening the knob and pulling to release the pin from the pole. You can then move the seat to the height you want and then you release knob to engage thep in in the closest pre-set hole and then tighten the knob up again. This holds it securely place and ensures there’s no shaking. The horizontal positioning uses a slider and you can place the seat where you want and tighten into place within the range of movement. Outside the ranges recommended you are likely to have to stretch for the pedals when you are below the minimum height, and when over the maximum height you will find you don’t get the full leg extension and feel cramped up. The 14 levels of magnetic resistance are controlled by the tension knob on the console. The levels are marked on the knob itself rather than on the display. The range of resistance goes from very easy to moderately hard. It’s not going to be tough enough for those who are already very fit and want challenging workouts – they are going to find it too soft for what they want. For others they’ll find they can get a good workout from it (including interval training) so that they can get their heart rate up and get a good sweat on too. The transitions between the levels is smooth and there isn’t any sudden changes in levels as you change the resistance to cause impact. At the top levels of the resistance you’ll start to notice a variation in the pedaling motion as the resistance starts to work as a brake. It might feel like its sticking a little or pulsing which is the flywheel slowing down as you move round the pedaling cycle. It does mean you have to concentrate more on your pedaling motion to stop it being more of an up and down motion. The amount of resistance is down to a set of magnets that are moved closer and further away from a flywheel without them ever touching. It operates very quietly and is low maintenance as there is nothing touching to wear out or cause a noise. The v-belt drive and precision balanced flywheel provide a consistent pedaling motion. There shouldn’t be any slipping at any level of resistance. They operate very quietly and there is no requirement for on-going maintenance. They are enclosed to stop dirt and sweat getting to them and damaging them. The cover also stops children and pets being injured by these moving parts. The pedals are large and have a plastic strap to provide a good platform to push against. You can get a good foot position for you and adjust the strap to hold your feet in position and prevent them from slipping. The pedals attach to a single piece crank, although not as strong as a 3 piece crank should be durable and strong enough for sitting and pedaling against the resistance. The thread size won’t be the standard bike 9/16 but is more likely to 1/2 ins. Although it is possible to stand on the pedals it isn’t designed for it. It will feel awkward. Also it is likely to reduce the life of the bike too. If that is the type of training you want to do you are better looking at a spin bike or indoor cycle although they aren’t as quiet (typically they don’t have magnetic resistance and many have a chain drive), you can see a selection of the best under $200 here and the best under $500 here. Seat. It has a large padded seat that can help with balance and comfort. It’s been made for those that don’t like the usual smaller seats found on most upright exercise bikes. If you don’t like the seat and a gel seat cover doesn’t help it is not straightforward to replace the seat. It is attached by 3 bolts rather than the standard bike fit. But it is possible to do. The easiest method if you want to do it yourself is to buy and attach a universal exercise bike seat adapter, then you can add any standard fitting bike seat to the bike. Or an easier answer is to take the seat and post to a bike shop and have them sort it for you. To make it easier to get on the seat the bike has a low step through design where you don’t have to lift your leg up over a high frame to get in position to sit on the seat. It is still a seat you’ll need to sit up on to rather than sit down as you would with a recumbent exercise bike (if you think that maybe a problem then the Exerpeutic 1000 with a lower seating position and seat back, legs are out front but it does have a larger footprint). Handlebars. These are fixed in place. They are covered to give a better grip especially when your hands get sweaty. They aren’t padded so if you lean on them you’ll find your arms aching after a period of time. Noise. It operates very quietly with the loudest noise to be heard is likely to be heavy breathing of the user. It means you can use it while you watch TV or when others are asleep without waking them up. You can even use it in an upper floor apartment and not annoy the neighbors – some do put it on a rubber exercise mat to make doubly sure nothing is heard down below. Cleaning Up. It’s not going to add too much to your cleaning routine. There is some cleaning required which is to keep the bike free from sweat which is very corrosive and will start to rust and jam up the bike if left on it. It only take a short while to clean it up. Also, you might want to put the bike on a rubber exercise mat if you want to stop sweat dropping on the floor. When not in use the bike needs an area of 22 by 43 ins which is reasonable compact but probably won’t fit in a closet – it is more likely that it is put in a corner if you can’t leave it out. If you do leave it out it doesn’t take up too much room and it won’t feel like you’re being crowded out by it. The bike weights 48 lbs but there is help with moving it around so you don’t have to carry it. There are two small wheels at the front of the bike you can tip it on to when you want to move it around. It is easy to do this and it allows one person to move it where you want as most of the weight is supported by the wheels. You may find the wheels stick on carpet and end up having to slide the bike which is still not too tough. On wood floors the wheels work well but might scratch so it does pay to check that out first. The bike is delivered part assembled. To complete the assembly usually takes about 1 to 2 hours but some people can do it much quicker. It includes all the tools required to get the job done but if you have your own you’ll probably find it easier. You are required to add to the bike the crossbars, the pedals, the seat post, seat, front support post, the console, handlebars and water bottle holder. One person can do this, but it is easier with two. It helps to have someone to hold the pieves steady while they are attached in particular the console. The most difficult parts of the assembly are completed for you (the diagram at the beginning show all the parts not what you need to do – so can be ignored). There is one fiddly part and that is attaching the tension cable which just needs a bit of care and a good reading of the instructions and diagrams to ensure you get the proper resistance when set up. The console that comes with the bike is basic. It doesn’t have pre-set programs or work with a fitness account for uploading your workout results. It has a good size LCD display that shows you distance, calories burned, RPM, time, speed and heart rate when both hand pulse sensors are gripped. You can manually move through the measures as you workout or you can set it to scan where it displays each measure for 6 seconds. It isn’t backlit so you can’t see your measures in poor light conditions. The console requires to 2 AAA batteries to operate. It does mean you can workout where you want as you don’t have to be concerned where a wall socket is. It turns on when you start pedaling or press the button in the corner. It turns off by itself after 5 minutes of no activity. There are a couple of issues with hand pulse sensors that people need to be aware of. First off you need to be gripping both to get a reading so you can’t move your hands as you’ll lose the reading and there will be a delay until you get a reading again. The hand pulse sensors for some people can provide a good reliable reading but many find that they can’t get a consistent reading from them. This is something that happens with all bikes with hand pulse sensors. If this is something you want then you may find it is better to get a chest strap and monitor and do this separate to the bike. Also, if you like to have a record of your workouts for tracking and analyzing this needs to be done manually as it doesn’t keep this information for you or upload to a fitness account. iPad and Tablet Holder – This is above the display on the console. You can see your measures as you watch your movies. It adjusts so you can also fit your phone or mpl3 player. It has anti-slip back so they won’t slide or move around. The bike doesn’t move around so you shouldn’t have an issue with them falling off. It might get in the way of watching the TV so you may need to angle the bike slightly to get a good view of it. Water bottle holder – There is bottle holder on the front post that is in easy reach although it does need a little leaning forward when you need a drink. You can slide the bottle in and out without too much effort and only need to slow a little. It doesn’t have speakers or charging port to plug the devices into while you’re working out. The manual does provide some information on stretching for warming up There isn’t any help with actual workouts or getting the bike to fit you properly. I’d have thought this would be a good idea for a starter bike. Fortunately it is possible to get that information online. It has about 10 reviews online and they are mixed which is surprising when compared to other bikes from Exerpeutic – they usually get better ratings in reviews. A couple of people had a problem with the thread on the left pedal which may be due to it having a reverse thread (as with all bikes – it stops it undoing as you pedal) meaning you have to screw the pedal in backwards. The other one is about the seat being uncomfortable which is not unusual. And the pedal motion becoming less smooth as you put more tension on it. This is common with bikes in this price range at the top end of the resistance – you do need to concentrate on pedaling more to overcome it. Otherwise the bulk of customers say they find it very quiet, like the simple console, some like the seat, it’s sturdy and they can get on with their fitness goals when they like. It is one of the higher priced basic upright exercise bikes. You do get some extras, getting oversized pedals, large padded seat, horizontal seat adjustment and a media tray compared to other models like the Velocity Upright Bike (where you get very little in extras), but you don’t get pre-set programs like you do with Schwinn A10 or for a little more the Ironman H Class 210 (But pricing can change and this was the situation when I checked out the pricing.) It is the horizontal seat adjustment that is the real difference of this bike to others and is what you are paying extra for – the added comfort this can bring. This pricing along with the current ratings probably explain why it isn’t more popular. Exerpeutic 2000 Magnetic Upright Bike is a good starter bike and one for those looking for moderate exercise. It has a large padded seat for better comfort and balance – it’s not to everyone’s liking but a number do – you can cover it with a gel seat cover for more comfort. The big advantage of this bike for this price range is the ability to move the seat backwards and forwards in addition to up/down. This allows you to get a better a fit for you overall especially in relation to the handlebars – it can stop reaching too much or being cramped. The bike isn’t really for those who are already fit and are looking for challenging hill climb workouts – the resistance isn’t going to be enough and it’s not designed for standing on the pedals. For others this is a quiet bike that you can use in your home when you want to improve your cardio fitness and burn calories to help with weight loss and toning.